A valuable Annual Giving initiative, the Stanislaus State Call Center employs well-trained student callers who are ready to share their stories and how you may support the University’s scholarships and programs. When you receive a call from a student fundraiser from (209) 667-3482, please remember, they are Stan State students helping to finance their education by working with the University to fund its mission of academic excellence. 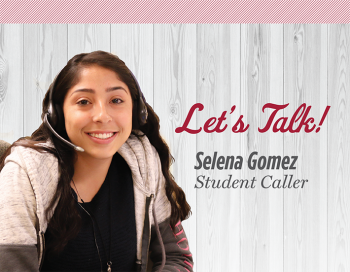 The Call Center employs nearly 30 students who work for six-weeks each semester providing information to thousands of Stanislaus State alumni while offering an opportunity to support the University in ways that matter. 1:30 – 5 p.m., 5:30 – 9 p.m.